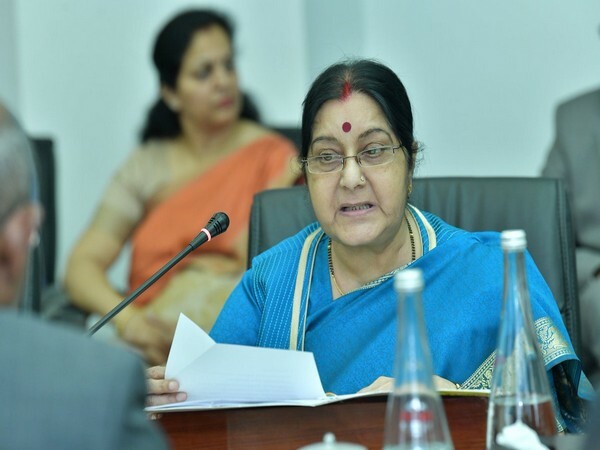 Hyderabad (Telangana) [India], Apr 6 (ANI): External Affairs Minister Sushma Swaraj on Friday slammed Congress president Rahul Gandhi and his family and said they should renounce their SPG security if they feel that terror is not an issue in India. “Rahul Gandhi says that terror is not an issue in the country. I want to ask him if terror is not the issue, why you take SPG security. All the (Gandhi) family is having SPG security. If terror is not the issue for you, then you write and give to the government that you don’t need SPG security,” Swaraj said while addressing a gathering here. “In 2008, biggest terror attack took place in Mumbai in which 166 people died. But the earlier government has not taken any step. When terror attacks took place in Uri and Pulwama, Narendra Modi took the step to conduct air strike,” she added. Besides Rahul, Swaraj also criticised Telangana Chief Minister K. Chandrashekar Rao for supporting Pakistan’s statement on the air strike on Jaish-e-Mohammad (JeM) camp in Balakot. “KCR said that Pakistan claims that no one got killed in the airstrike. He is supporting Pakistan’s statement,” Swaraj said. “I want to convey to KCR that Prime Minister Narendra Modi has worked for all the sectors of the public in the country. He has started many schemes and initiatives in the country. KCR has not implemented central schemes in the state,” she added.